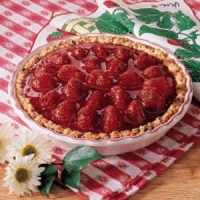 Line baked and cooled pie shell with 2 cups large uncooked berries, arranged hulled side down. Make a sauce of the other 2 cups of berries, cut up and cook until thick with sweetening, water, cornstarch and salt mixed together. Remove from heat, add butter and stir well. Cool and pour over berries in the pastry shell. Refrigerate until ready to serve. Spread with coating of whipped cream or whipped topping. Makes 6 servings.